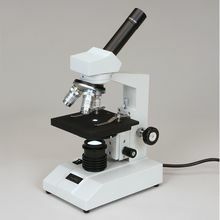 Carolina&apos;s quality Wolfe® CFL Educational Microscope is well designed, versatile, durable - and an exceptional value. Enjoy the features that you need including inclined, rotatable head, in-base fluorescent illuminator, and disc diaphragm. Fluorescent illumination virtually eliminates heat buildup that can affect live microorganisms. Separate coarse and fine adjustments give faster, more accurate focusing at high magnifications. Teacher&apos;s Choice! The right features, the right price, and the advantages of fluorescent illumination. Grades 9-12. If you&apos;re looking for an educational microscope that&apos;s well designed, versatile, and durable, Carolina offers you an exceptional value with our quality Wolfe® CFL Educational Microscope. Cool performance - Fluorescent illumination radiates little or no heat compared to lower-priced models with tungsten illumination-a very important benefit when you&apos;re working with live microorganisms. Fluorescent light is also whiter and promotes longer bulb life. The focus mechanism has separate coarse and fine adjustments, incorporating travel stops and a slip clutch to protect slide, objectives, and focus mechanism. Cool option - This model&apos;s stage is predrilled for an optional add-on mechanical stage (item #591641).